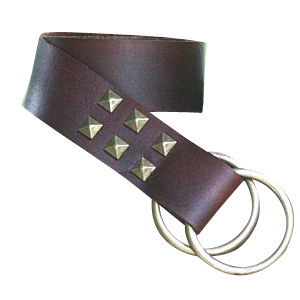 The Studded Ring Belt is made from 100% quality leather and features a design that deviates slightly from a traditional ring belt. Despite this difference, the belt behaves exactly like a ring belt should, it belts clothing and supports weight. 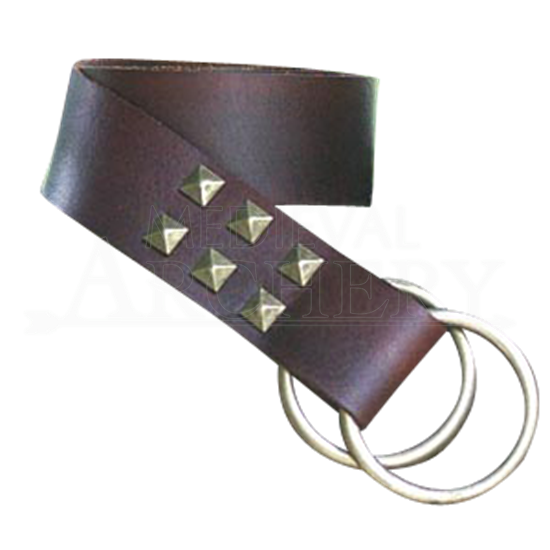 This attractive ring belt is available in black or brown leather and features six pyramid studs decorating the ring end of the belt. The brown leather get antique brass studs while the black leather get silver studs. It is made long, as a ring belt requires a knot to be fastened and the knot usually requires several inches to complete. However, when worn in a proper knot, any ring belt, including this one, will behave like a belt should, supporting weight, up to and including sword frogs (complete with swords) as well as things like belt bags, tankard straps, and more. If you are looking for a traditional and authentic-looking belt to add to your attire, then consider adding the Studded Ring Belt. It may not be your traditional ring belt, but it adds a touch of style and panache to any almost any medieval look. One size: Approximately 64 inches long. To secure the ring belt you must tie a knot through the ring, the knot generally takes up about 10-12 Inches of the leather.